Curb College hosted a panel of industry professionals on Monday, Jan. 25 to discuss music distribution and brand promotion. The panel of three Belmont alumni included Label Marketing Representative for Universal Music Group (UMG) Christiana Sudano, EMI Promotions Coordinator for Universal Music Group Jamie Graves and Executive Director of A&R for GoodMusicAllDay.com Kayvan Daragheh. 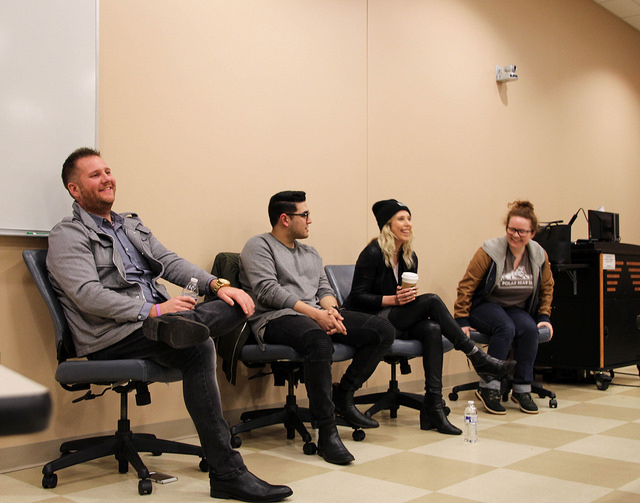 The seminar featured each panel member’s story of their journey from Belmont to the music industry, complete with advice and recommendations for present students. Sudano explained that the entertainment industry is all about climbing a ladder. “Everyone has to start from the bottom, so you might as well enjoy your way up. I promise it will be rewarding.” Sudano has worked her way up at UMG starting as a college representative, moving to intern and now has held job positions in both Los Angeles and Nashville. Sudano emphasized the need for students to balance enjoying their time in college while also gaining industry experience and expanding their network.